Peter Bakowski BENEATH OUR ARMOUR, Hunter Contemporary Australian Poets, Melbourne, 2009, 79 pages. 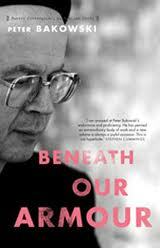 BENEATH OUR ARMOUR is Peter Bakowski’s sixth collection of poetry and was recently short-listed for the C.J. Dennis Prize for Poetry in the 2010 Victorian Premier’s Literary Awards. The book consists of thirty-one excellently crafted and remarkably varied portrait poems. The portraits in this collection are of real and imagined people and many have been previously published in literary journals over several years. The poems cover a wide range of historical periods, perspectives and voices; as diverse as a gulag inmate (‘Portrait of Pavel Shalamov, Magadan Labour Camp, Siberia, April 1952), a sales executive (‘Portrait of Leonard Drysdale, district sales manager, Birmingham, England, 1946’) a thirteenth century aging warrior (‘Instructions to horsemen, Krakow, Poland’), and a traveling blues musso (‘Blues’). On the question of style, Bakowski succinctly expressed to Ralph Wessman in an earlier interview what he hoped to achieve as a creative artist: ‘More than anything, I’m trying to be visual, attempting to be a painter with words. A very influential quote for me in a book of essays and memoirs to do with Charles Bukowski was along the lines of, there’s all these books analyzing, dissecting writing and literature, I don’t know what all the fuss is about, writing is painting. Those three words are a lighthouse effect for me, which I try to keep in view when I set sail upon the page’ (Famous Reporter #30 http://walleahpress.com.au/bakowski.html). This striving for visual clarity is certainly reflected in ‘Bernard and Monique’, a third person narrative poem about a young French couple who specialize in robbing expensive villas. After a maid is killed during a botched burglary in Paris, Bernard undergoes plastic surgery to hide his identity and temporarily moves to Stockholm with his girlfriend. It is the lure of money and Bernard’s love for Monique (he didn’t want her ‘to go back to whoring’) that spark their renewed surveillance of properties during their day trips between Monaco and Cannes. but the same old cravings. Although Bernard and Monique are criminals, as readers, we empathize rather than judge or condemn them. They share an emotional bond and an engaging back story which Bakowski creates in a few sparse fragments, in a matter-of-fact way. I cannot bring to my life. at lovers who flee from my reach. Construction blueprints demand your scrutiny. Contract for Asia’s tallest building. pills to help you sleep. A bulk of the poems in this collection are about creative people: painters (‘Dougal Nunn, painter, as described by Dennis Arden, publican, Enniscrone, Ireland’), writers (‘Sylvia Plath writing in her journal, 23 Fitzroy Road, London, February 1963’), a sculptor (Arthur Marsden), a musician (‘Blues’), a portrait artist (‘Caspar Morton, portrait artist, talking about his life and work’) and so on. chipping away, the form appearing. I forget the clock, forget to eat. I’m a pair of eyes, looking, absorbing, deciding. who will appear in the next chapter. and whom he’ll kill first. our love a lit fuse. Some poems in this collection are auto-biographical which provide a more personalised perspective on Bakowski’s portraits and shows how his identity has been shaped through his experiences. He explores his early childhood (‘Of fathers, books and libraries’), his young adult life as a backpacker (‘Hand me my travelin’ shoes’) as well as his writing residencies in China as a mature and accomplished poet (‘Macau days’). At the age of twenty-eight I went travelling for seven years. John Fante, George Orwell and Primo Levi. That kept me reading till dawn. In reading this volume you get the impression that Bakowski has pain-stakingly crafted every single word in this book. His language is pared down and minimal in its use of metaphor. The clarity of the writing has an understated profundity. Bakowski has a colossal imagination and each time he begins a poem he attempts to say something new. His poetry is refreshingly egoless & its ongoing inventiveness delivers the longevity it seeks. Q1: Peter can you briefly explain your first experiences with poetry and how you initially became interested in writing it? the inside of your head and heart and you could do so directly and honestly with no obstacles or fog in your writing. I taught myself to write poetry by sitting down at a typewriter, feeding a blank sheet into it and trying out words on the page. A poet's material is what they experience, see, think, sift and can imagine. A poet is a observer, a thinker, an explorer. I consider that to be a creative person one must be alert to the world and remain so. http://bakowskipoetrynews.blogspot.com/ you mention that you ‘served an eleven year period self-imposed apprenticeship in writing’ with your best work being included in your award winning book In the human night (1995). Can you sum up what you learnt about writing and people during this formative period? Answer: I learnt the value of facing a completely blank page. I learnt the value of facing a completely blank page on a regular weekly basis, each Monday, where I allocated the whole Monday to writing. I really promote the idea of regular protected writing time. Keep the mind, the senses in training. Facing a blank page is a mixture of being focused but calm even if the subject matter is difficult/personal. It's about openness. Face the blank page. Be open and non-anxious. No negative voices saying "I have no ideas. I have no good ideas. All I've written recently is lame etc". I learnt that each word has a hue, a power, may be used well or poorly. I always ask myself, "What am I trying to say in this poem and have I said it clearly and strongly?" In my self-imposed apprenticeship I wrote poems about literary and artistic heroes - Charles Bukowski, Billie Holiday and Janet Frame. No matter how many books I write in my life time they'll all be about what it's like to be a human being. This is my life's work. As a poet I remain enthralled by how human beings are a mixture of tenacity and vulnerability. It's tragic and heroic. I have empathy for the struggles of the human being. The apprenticeship is life-long. To choose, test, arrange words. To write clearly. To reveal without word fog what you have to reveal. Question 3: Your book BENEATH OUR ARMOUR is focused on character studies of a wide variety of people. Some poems are auto-biographical, others are based on historical figures, others are based on your residencies in China. How did you decide which historical characters to write about? How extensive did you have to conduct your research? At what point did you decide to collect your poems under this one volume? Answer: The historical figures I decide to write about are individuals that I find intriguing, whose lives have been "tidal" - a lifelong cycle of creativity, alertness and self-awareness versus self-destructiveness, years/periods in fog, darkness, self-delusion. I try and reveal the epic, heroic, tenacious nature of this individual struggle while not losing sight of their vulnerability, human fears and anxieties. In revealing these individuals I do so without judging them. I research a historical character properly. For example, in writing the portrait poem of Sylvia Plath, I read several biographies of Sylvia. In fact I read the biography, "Bitter Fame" twice. I also read a biography of Ted Hughes and a biography of Assia Wevill, the woman that lured Ted away from Sylvia. I've been writing character-driven poems my whole writing life. I decided after the publication of "Days That We Couldn't Rehearse" to focus in my poems on what I call "the sacredness of the individual". What continues to fascinate me is the individual response to an event, personal or global. The variety of human responses to crises, changes, ruts and life is what I try to reveal in portrait poems of individuals. An individual is not one self. I believe a person is many selves. A person may surprise or dismay themselves constantly. The best painters in painting a portrait seek to reveal the essence of that person. This is what I'm trying to do in portrait poems. Reveal a human being yet no label, no category, no assessment. I spent five years writing BENEATH OUR ARMOUR. Q4: In your preface to BENEATH OUR ARMOUR you state that your ‘aim as a poet is to write clear and accessible poems, to use ordinary words to say extraordinary things’. To what extent do you consider you have been successful? As a general guide for other readers, who else is achieving this odd combination of clarity and profundity today in Australia or elsewhere? Answer: My primary focus on clarity in my poems is something I believe in to my core. I'm trying to reveal, to be visual without fog, cloud, obstacle or stumbling block. I'm trying to communicate what I see, what a character in a poem sees, feels, thinks. I want the poem to be direct, allow the reader entrance. walk away from the poem or I get angry at the poem. The result is that I don't finish reading the poem. I feel my chosen path of clarity has been successful. My first book, "In the human night" won the 1996 Victorian Premiers Award for Poetry. My latest book, "Beneath Our Armour" was shortlisted for the 2010 Victorian Premiers Award for Poetry. I continue to get positive feedback regarding my poems from the general public. If the general public, individuals between 16 to 88 appreciate my poems, then I consider I'm on the right track. I'm trying to write poems that are worth reading, that the reader or listener may find truthful, thought-provoking or humorous. Charles Bukowski and Stephen Dunn. Interestingly, they are all North American poets. Q5: In re-reading your first collection In the human night there appears to be a huge leap forward in the maturity and sophistication of your more recent work, yet it can be argued at the expense of the spontaneity and experiment of your word play. How do you respond to this statement? How has the style and subject matter of your poetry evolved over the years? Answer: I believe a creative person should move forward. As Robert Frost said, "Make your next poem different from your last." Having now written poems exclusively for 27 years, I'm trying to be more visual in my poems without over-describing. I'm also writing more character-driven poems where the voice, the beliefs and perspective of the narrator belong to the narrator rather than myself. The character-driven poems allow me to get away from the "I, I, I, me, me, me" poems. I'm trying to be tighter in poems, write seamless poems, where the reader can't see the stitching. Having practiced writing poems for 27 years now I hope I'm more in control of the poem, no leaving the focused road of the poem, but at the same time I like to still briefly let go of the steering wheel. My first book of poems, "In the human night" is peppered with abstractions. I'm now an-anti abstraction guy, saluting Ezra Pound's advice, "Go in fear of abstractions". Similarly, since "In the human night" I now never use a simile. There aren't ANY similes in my last two collections, "Days that we couldn't rehearse" or "Beneath Our Armour". My current thinking is that I want to write poems about individuals, real people I've researched or individuals I've created. The individual and their internal wars remain a key interest, also the drama of an individual's self-awareness versus their self-delusion. 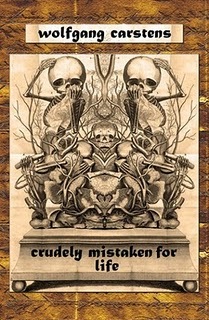 influenced by my long held interest in aphorisms, quotations and proverbs. Concentrating on these aphoristic two line poems has been a way for me to wear another hat beside the portrait poem hat. I only look back over my shoulder at past poems in that I don't want to repeat myself, fall back on "Bakowskisms". I'm focused on writing the best poem I can while allowing the poem to be the camera of the poem, where the reader sees what the camera of the poem sees, not the person using the camera. Q6: What general advice would you give to talented young writers of poetry? 1) My advice is to write clearly. When writing a poem always ask yourself "What am I trying to reveal/say in this poem and have I revealed/said it clearly and strongly?" 2) Read other poets, examine what they put in and leave out. 3) When you write a poem check that the poem has an engine, a momentum that keeps the poem moving forward. 4) Question the adjective. Ask yourself whether your adjective actually adds to the line, adds to the poem. The overused adjective will do the line and the poem more harm than good. 5) Remember you are trying to create pictures in the mind's eye of the reader/the listener. 6) Check that the world you've created in the poem is visible without over-describing. 7) Seek your whole writing life to widen your subject matter. When you sit down to write a poem, don't go "Oh migod, I'm writing a poem with a huge capital P." Writing a poem is a mixture of focus and calm. Any anxiety/any negativity about your writing capabilities when facing the blank page will close your mind to writing that day. 8) Poetry is sculpture. Get rid of any/all non-essential words from each line. Give yourself a dollar for every word you can get rid of. 9) Continue. Persevere. Remember that no writing time is wasted. You may make huge piles of dirt and slag before you get to the gold. 10) Mine your life experience, the pivotal/significant moments in your life. They are not trivial. Don't cosmeticize or sentimentalize the past or a relationship or a person. 11) Write poems where the narrator/main character of the poem is of the opposite gender to your own. 12) Realize that you will remain a student of words and language your whole life. 13) Set up weekly protected writing time and stick to it. Thanks Peter for taking the time to explain your work in such detail.